Situated on the peaceful and relaxing child friendly St Helens Holiday Park, our family owned caravan is in a pleasant position, not too far from the car park and a short walk to the outdoor pool, launderette and games room. New in 2013 is the decking, giving extra space and a lovely place to sit on a warm summers evening. Our comfortable caravan, regularly used by our family, is fully equipped with added extras such as DVD's, books and games. The well stocked and fairly priced village store is a few minutes walk away, as is the local pub, cafe, village green and 2 x restaurants. The beach is a 15 minute walk away, by road or across the old golf golf course. If you prefer to drive there are plenty of parking spaces near the beach, where you can also find Baywatch on the Beach Cafe. The site is car free and the caravan is a very short walk along a path from the car park. Trolleys are available for moving luggage. The holiday park also has a games room, launderette, with washers, tumble dryer, iron and ironing board. Reception is manned during office hours, with 24 hour emergency call out. The village is a few minutes walk with a well stocked store, pub, cafes and restaurants. Order delicious pastries the day before! Nearby attractions include Blackgang Chine, Robin Hill Park, Osbourne House, Bembridge Harbour, Sandown Zoo, the Garlic Farm, Rosemary Vineyard, numerous beaches, country and coastal walks. Cleaning / Towels / Linen : Property is cleaned after each visit. Bed linen is included. Towels are not included. Other: Dining area with seating for 6, round table. Nowhere is far on the Isle Of Wight and you will find something for everyone within a short distance; from popular beaches, historic houses, childrens activity parks, sailing, horse riding .... the list goes on. 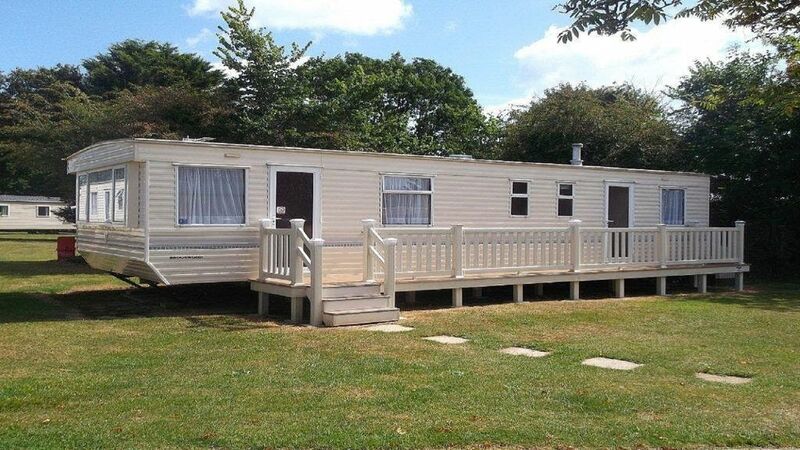 We have recently sold our holiday home on the Isle of Wight and so now have this caravan so we can continue to spend time on this island that we love. This is a family owned caravan. Outside: The caravan has south facing decking, new in 2013 with bench. There is a shared heated outside pool from May through to September on site. Also a green area outside the caravan with childrens play areas and field, including badminton and football nets within a few minutes walk (one can be seen from the caravan). Quiet village location with short walk to village green and about 15 minute walk to beach with the lovely Baywatch cafe where there are beautiful views over the solent. Lovely countryside views from the village where you can enjoy meals in either in the local pub such or the two restaurants. Also on bus route. Toilet with wash hand basin and mirror. Drying facilities on site. Iron and ironing board also in site facilities. Our caravan is short walk from parking area. There is free internet Wifi on the caravan park but it does not extend to the individual caravans. Good size living room with comfortable seating. Decking area on side facing south. So gets lovely sunny area. Our first holiday in a mobile home, spacious caravan, enough room for 6 people, nice comfy living and dining area. Very nice neighbours. Brilliant central location. We had an amazing holiday with our little boy and my parents. The caravan was perfect, had everything we needed and spacious enough to not feel cramped in. The site is tucked out of the way and nice and quiet but with a really good pool. Very close to a well stocked shop and nice pub, couldn’t ask for more. Very helpful owner also.